The goals of the program 'Turbulent Mixing and Beyond' are to expose the generic problem of non-equilibrium processes to a wide scientific community, to promote the development of new ideas in tackling fundamental aspects of the problem, to assist in application of novel approaches in a broad range of phenomena, where these processes occur, and to have a potential impact on technology. TMB program provides the opportunity to bring together researchers from the areas, which include and are not limited to fluid dynamics, plasmas, high energy density physics, astrophysics, material science, combustion, atmospheric and earth sciences, nonlinear and statistical physics, applied mathematics, probability and statistics, data processing and computations, optics and communications, and to have their attention focused on the long-standing formidable task of non-equilibrium dynamics. Program 'Turbulent Mixing and Beyond' was founded in 2007 with the support of international scientific community and of international funding agencies and institutions. This is the program established for scientists by scientists. It is merit-based, and is shaped by requirements of novelty, academic credentials, and information quality. To date, TMB community unites thousands researchers worldwide, including scientists from academia, national laboratories, corporations and industry, at experienced and at advanced stages of their careers. TMB International Conferences were organized in 2007, 2009, 2011, 2013, 2014. They found that TMB-related problems have in common a set of outstanding research issues; these challenging TMB problems can indeed be solved, via discovery of their fundamentals; the TMB participants conduct highly innovative research and their interactions strengthen the community might. 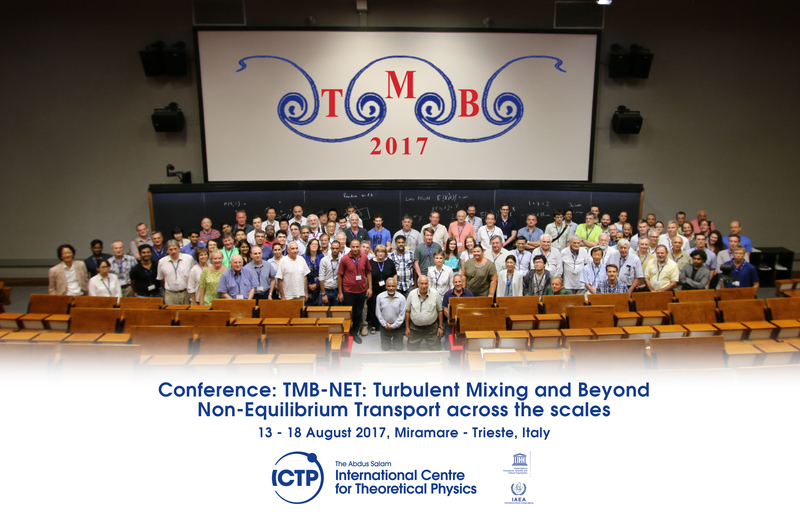 TMB-2017 is the 6th International Conference 10th Anniversary Program. It considers the broad variety of TMB themes, and is focused on fundamentals of non-equilibrium transport. Its objectives are to advance knowledge of non-equilibrium dynamics, and to have a positive impact on our understanding of a variety of natural phenomena, from atomistic to astrophysical scales, on principles of theoretical modeling of non-equilibrium dynamics at continuous and at kinetic scales, on methods of experimental diagnostics and numerical modeling techniques, and on technology development in, for instance, fusion, nano-electronics, telecommunications, aeronautics, gas and oil industry. The Organizing Committee hopes that program "Turbulent Mixing and Beyond" will serve to advance knowledge of fundamental aspects of non-equilibrium processes, their predictive modeling capabilities and physical description, and, ultimately, control of these complex processes.